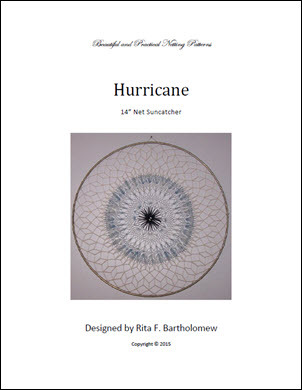 This pattern is for a 14″ suncatcher made with circular netting using the Sunshine Center, Fan Increase Stitch, Dancer Increase Stitch, Ray Decrease Stitch, and Block Edge. For more information on this pattern click here. The instructions in this pattern do NOT include directions on how to tie the basic netting knot or any other basic netting skills. If you need to learn those skills, click on “Learn To Net” in the navigation bar at the top.